ASEEES is accepting applications for two dissertation research fellowships! 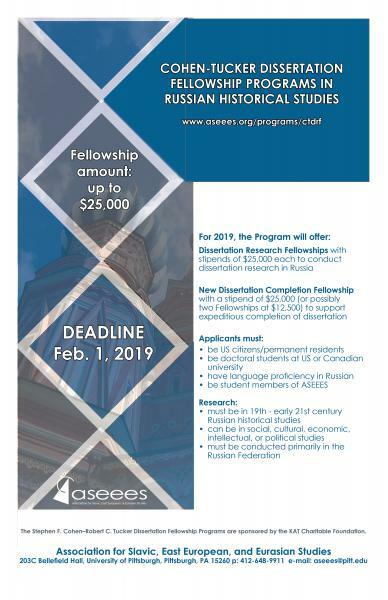 Established in 2015, the Cohen-Tucker Dissertation Research Fellowships provide a maximum stipend of $25,000 for doctoral students at US and Canadian universities, who are citizens or permanent residents of the US, to conduct dissertation research in Russia. The Program is open to students in any discipline whose dissertation topics are within 19th – early 21st century Russian historical studies. As of 2019, ASEEES is offering a Cohen-Tucker Dissertation Completion Fellowship, with a maximum stipend of $25,000, for a doctoral student at US and Canadian universities, who is citizen or permanent resident of the US, to complete their dissertation. The Program is open to students in any discipline whose dissertation topics are within 19th – early 21st century Russian historical studies. A flyer describing this program is available here. This entry was posted in Funding, Graduate Programs, Travel/Study Abroad and tagged February 2019 on January 31, 2019 by Kira Azulay.